Hi everyone. I have been inspired by RagingMonkeys, who is currently working on recreating San Andreas - all 36 sq km - in Minecraft. 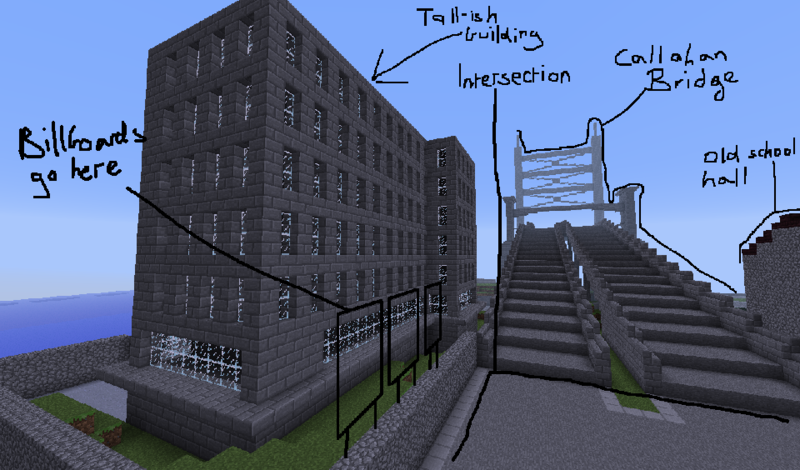 This gave me a similar idea, to recreate Liberty City (from Grand Theft Auto III) in Minecraft. Liberty City is much smaller than San Andreas, so the project should be easier to do. I will update this post periodically with updates to the project. The latest post will go to the top of this post. Please let me know if you support this project or have help to offer. I plan on making building interiors, but only the ones you see in GTA III. Whether it be safehouses, Ammu-Nation stores, garages, areas you see in cutscenes or even the window you lob a grenade into in "Silence the Sneak", I'll have it there. Underneath the map is hollow, much like the environment in GTA. The map is actually a superflat map with 1 layer bedrock, 3 layers dirt, 50 layers water, and the rest is air. 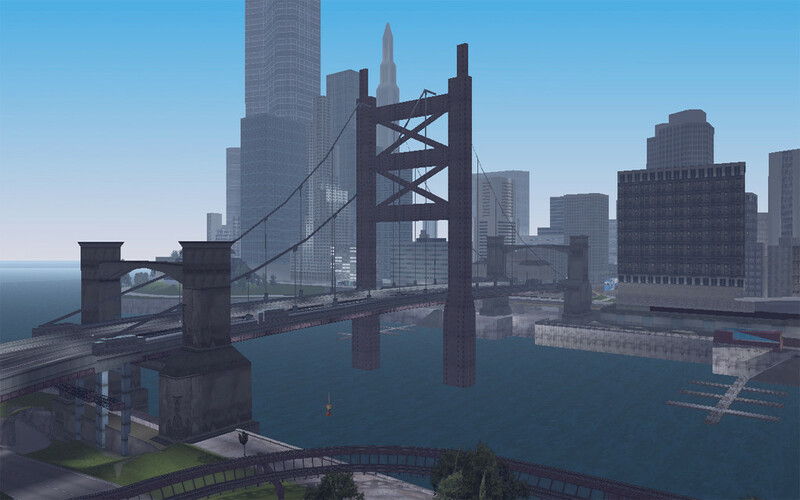 This is the GTA III version of Liberty City. It's not the GTA IV version, nor is it is the version from L.C. Stories or GTA Advance. Originally what I had in mind was to eventually release a texture pack for this map using textures extracted from GTA III (adapted to Minecraft blocks of course), but also keep it Vanilla texture-friendly. As it turns out, the textures from GTA are very hard to match with MC blocks, and unfortunately, I won't be able to keep it very friendly to vanilla textures. I'll make it as close as possible, but it will be hard to do. The first and latest post can always be found here, but the latest will also be posted separately. This is a mini-update. I only changed two things, so I don't think it's enough for a full update. When I do these, don't always expect photos, because chances are, the change isn't interesting enough to post them. I fixed the Callahan Bridge. It had three X's on its suspension tower, so I fixed it to two. There was a problem at Callahan Point. The curve in te edge of the island of shaped badly and not smoothly, so I fixed it. The problem: I run Minecraft on a Mac, which is my only computer. PCs are much more flexible when it comes to gaming, and many, many, MANY games over the years have simply not worked on my Mac. I am in no financial state right now to buy a new PC, but I am busting to get one. MCedit doesn't work on my Mac, a problem I am in the process of working out. Until then, I can't make serious progress on this project, but I have started a small portion of Portland by hand. Some bits will need to fixed with MCedit later, because some roads are shaped incorrectly and are in the way of other objects. For example, the winding road Greasy Joe's cafe is on (in Callahan Point) is shaped badly, and the road goes a bit too far south, meaning the cafe is too far south, meaning the truck parking lot north of it is too far south, meaning that a steel support pillar underneath the Callahan Bridge ends up right in the middle of a road. This is the only major inaccuracy, the rest of the tiny portion I have built is more or less accurate, apart from a few simple errors I made when shaping the edge of the island. FYI, when I get up to building the hills in northern Shoreside Vale, I'm probably going to close them off at the the back to make the map feel a bit more complete, . Then again, it might be fun to have Ghost Town in there. I'll see. This map is the Grand Theft Auto III version. It's not GTA IV, nor is it GTA L.C. Stories, so the Portland and Staunton Ferry Ports will be replaced with the tunnel entrance and Army base, respectively. Here is a birds-eye of my progress compared with that same part of a Portland map. Greasy Joe's and the roads are colour coded. I wish you all the best on this endevor. i will keep my eye out on this post and see how you are doing from time to time. Its looking good so far. First thing i would is find a highly detailed map of Liberty city, then pixelise it to the dimention of the actally size of the city (1 pixel to minecraft block) so you can plan out your building and roads to perfection. I hope this helps bro. Hey, thanks for the tip and support, dude. I have seen extremely highly detailed maps of San Andreas (more than 6000x6000) from an aerial view online, but the largest I could find for Liberty City was 1750x1550. I'm sure this will be big enough to pixelise though. I am unsure how to match the map to exactly 1 metre, apart from estimation alone. Unless my map has a scale, which it doesn't. May I ask you where you found your San Andreas map, if they have any other hi-res GTA maps there? Thanks again for the support. I have sorted out the problem of the incorrect roads, but there is another problem I need to fix. Just south east of Greasy Joe's, extending off the road is a dirt road. The dirt road leads off into a forested area by the edge of the sea, but there is an issue with parts of the road not lining up with features on the map that they're supposed to. 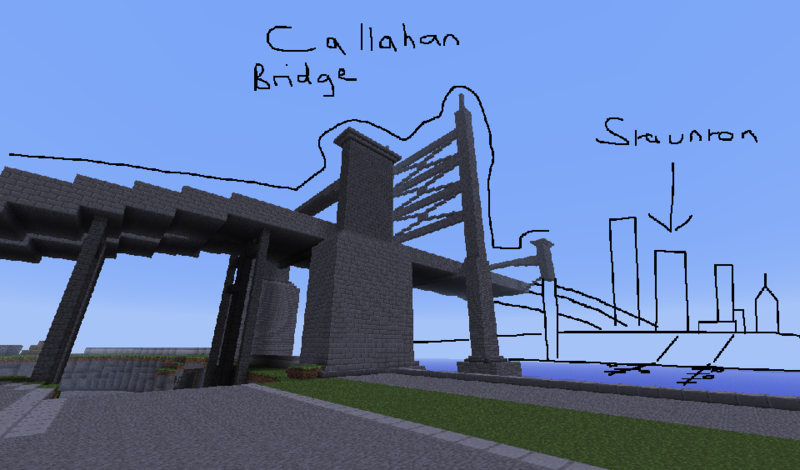 I have built a lot more of the Callahan Bridge, and am up to the concrete pillars on the Staunton Island side. 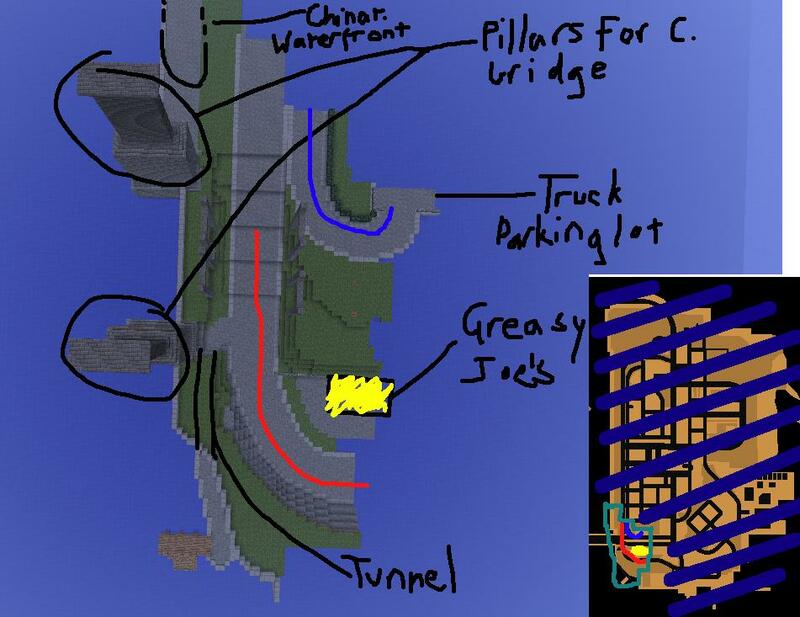 I have built all of the road parts from those pillars to bridge's landing in Portland, and part of the four lane highway it connects to. The road Greasy Joe's is on has been extended up to an intersection in Atlantic Quay. The forested area across from Greasy Joe's has been started, although I won't add trees to the map until much later on. There is a scaling error in this area that I need to fix as well. Greasy Joe's diner has been built, albeit to a very basic state. There is a building just south of the intersection that the Callahan Bridge lands into. It is pretty tall, but I have built most of it done. The first floor is blank, apart from some garages on one side. The second floor is surrounded with large loft windows with a ledge outside them. The rest of the building is a very poorly-textured array of normal windows. I recreated the building as best as I could, and placed grey wool two blocks behind each glass pane (two blocks so that the glass doesn't connect to the wool). I made the Old School Hall and part of its parking lot, but it isn't very good and will be redone later on. I'm thinking of editing the paintings in my texture pack to have ads on them for billboards. The Old School Hall needs to be redone. I hope to have another update out soon. This is a mini-update. I only changed two things, so I don't think it's enough for a full update. When I do these though, don't always expect pictures. I fixed the Callahan Bridge's suspension tower (I accidentally built it with three X's on it, fixed it to two). There was a big problem at Callahan Point. There is a short tunnel leading to a pier, and the road it's on curves around with the edge of Portland Island. This curve was too short and caused problems further east at a forested area, where there was too much space to fill that does not exist in the original map. So I fixed it. Looks great. A couple of things I'll let you know about to help. First, the Mac. Can be solved. Search for a program called Boot Camp on Google. That should allow you to be able to run MC Edit. (I thought there was a Mac version of MC Edit). Secondly, you should look for the tool that can turn models into a sculpture made out of MC blocks, much like what is being used on the San Andreas map. It will also allow everything to match up. Third thing, you should build the map on a flat world. Reason being, the sky scrapers on Staunton Island may not fit under the height limit and may look shortened. The main problem is you don't have Windows. You don't necessarily need a PC, you can use your current computer, but it will need to run Windows apps to be able to use the tools to extract the models out of GTA III. I had tried the Mac version of MCedit, but couldn't get it to work for some reason. I could use my brother's PC which has GTA III installed too, but I can't rely on being able to use it, which is why I used the Mac. In the meantime, I'll have a look for that tool, it sounds very useful. As for the Staunton skyscrapers, I'll look into it. You are probably right, but as long as they are less than about 200 metres tall, they'll fit. I'm pretty sure that the Jeffereson St Credit Building, the tallest one, is about 1250ft, so it will have to be a bit shortened. I built it on a custom flatland map with 1 bedrock layer, 1 dirt, 50 water (so there's plenty of space for Porter Tunnel and Subway), and the rest air. GTA3 is my favorite game of all time! I think I remember you talking about building this in RagingMonkeys' SA thread. This is exciting! Thanks for all the support everyone, it really helps me a lot. I have figured that if I want to avoid having to re-build parts of the map using different blocks later on, I should begin to work on the texture pack. The first thing I want to do is the custom paintings. The textures for shops, windows, doors, garages, etc would be too hard to make out of blocks, so I will use paintings. It's easy enough to go and edit the .png that the paintings use, but there aren't enough large paintings there for me to use. I am limited to the two or three 3x4 paintings, but I will need more for the rest of the textures. If anyone knows how to make custom-sized paintings, please let me know. Amazing! I wanted to do this map, but school and my ShockCraft resource pack don't leave me enough spare time as to do what I want. I'm totally supporting this map, continue with the great *scratch that, EXCELLENT* work! Thanks for the support. I haven't had a lot of time to work on the map lately but hope to have a new update out soon! I wonder, then - Is anyone doing Vice City? Another guy called meilkas1995 is also working on the same project and he seems to have gotten a lot farther than you. However, don't be discouraged, it looks pretty good so far! Cool, do you have a link to a thread or something for his project? I haven't worked on my project in a very long time, and kind of underestimated the time and difficulty of making the map and a texture pack for it. I don't get much free time to work on it anyway, so I don't know if this will ever be finished. My computer is terrible and hasn't been able to run Minecraft smoothly on the lowest settings since the latest update. I regret posting on here so soon about the map, because I don't want anybody waiting for it to be done or expecting updates regularly. I should've waited until I'd made considerable progress before posting, because I can't devote a lot of time for this. So consider this project abandoned, or at least postponed until further notice. DAMN ! you make GTA III Map ?